Zombies from Outer Space (2012) - English Review - Frog Bros.
Local scientist Robert Hölzlein has a hard time figuring out what happened to them, the only thing that seems off are the strange marks around their breasts. 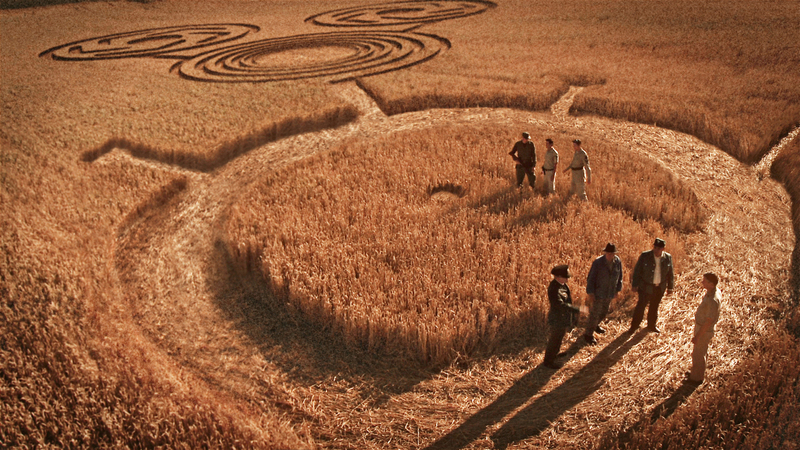 Things become even more weird when captain John Welles, stationed at the nearby American army base, discovers a crop circle and an unidentified flying object while he's out on a routine flight. At first he has a hard time convincing his superior or fellow buddies about his findings, but when an alien body gets dug up, it's time to find some answers. The only thing Robert is reasonably sure about is that Maria, a young woman who delivers food all over town on a daily basis, has something to do with it. This ups the stakes for both Hölzlein and Welles who are craving for her affection. When suddenly dozens of zombie aliens claw their way out of the soil and start attacking everyone, Robert and John need to find a way to stop the invasion and keep Maria safe from harm. Zombies from Outer Space won last year's BUTFF Award for Best Feature Film and was directed by German Martin Faltermeier, a professional cameraman and gaffer with whom I had the pleasure of having a lengthy chat at this year’s edition. With the help of a lot people, Faltermeier tried to achieve an almost impossible task: paying homage to the old B sci-fi movies. Reviewing a low-budget movie isn't an easy thing to do. It's hard to rate it the way you would do a flick that had a bigger crew, a more experienced cast and, well, just more financial resources. As a critic, you have to try and recognize the labour of love whilst not being blind to the core-aspects such as screenplay, camerawork, directing,... Therefore I'm glad to say that my overall experience with Zombies from Outer Space was a positive one. What's clear is that someone with experience in the audiovisual department led this movie. There are some nice shots scattered throughout its runtime of 95 minutes, the details in wardrobe and set-design are noticeable and the lighting, especially during the night scenes, is well executed. The main downside about this movie is the pacing, which is kind of slow during the first 45 minutes. Though the actors portraying the protagonists Maria, Robert and John do their best to cover up the lack of events happening, things can get a bit dull sometimes. The intro, the amount of cheesiness and the goofy lines do help to keep the attention firmly on what's happening on-screen, so there's never a question of just turning off the television set. The silly dialogue, the clearly inadequate and chubby local police officer, the obviously evil doctor, the not so well equipped cockpit of Welles' jet,... It all helps creating a B movie feel, with that cockpit aspect being a clear throwback, for me personally at least, to the Ed Wood movies. Zombies from Outer Space really starts delivering around the 50-minute mark, when the living dead rise and go on a rampage. From that point on, I was absolutely hooked and having a blast. The aliens looked good and I liked the way they moved. Nothing huge but it shows that Faltermeier thought of the little details. The execution of blood and gore was top notch as were actually all the visual effects. No way you would link this to a very low-budget movie while obviously knowing you're watching green screen shots. Whilst the final act is unfolding, right until the end-credits start rolling, there's no doubt that the screenwriters know their movie history. When the evil scheme is completely played out, you realise that every silly thing written down and acted out was done on purpose. Well, not everything, the acting maybe could’ve / should’ve been a little bit better at times. Zombies from Outer Space delivers, but keep in mind that the first half is a bit of a struggle and some shots tend to drag a bit. When the screen turns black though, you just have to give these guys a lot of credit.